Those who immigrate to the U.S. are generally assumed to be in pursuit of the "American Dream." And rightfully so, considering that the U.S. offers some of the greatest economic opportunities in the world. But what about those who move to the U.S. for other reasons? Since 1980, the U.S. has been home to nearly 1.8 million refugees and asylees who have moved to the U.S. in order to escape persecution. They're more in search of safety than the "American Dream." In the 1980s the Bhutanese government implemented policies of "Bhutanization" where the Lhotsampas people (an ethnic minority) were deprived of citizenship and civil rights and; eventually, forced out of the country. Dispersed and living in inhumane conditions in refugee camps on the outskirts of Nepal and West Bengal, the U.S. provided the only opportunity for a safe life. Saddam Hussein's oppressive regime and mass violence from both the Gulf War and the U.S. 2003 war have led to large numbers of refugees from Iraq to flee to Iran and Saudi Arabia. The Iraqi resettlement in the U.S. has been controversial but has provided Iraqi refugees with a much safer environment. War, internal conflict, and the collapse of the government have led the Democratic Republic of Congo to be one of the most dangerous countries in the world. Since sexual violence is used as a weapon of war, the DRC is particularly dangerous for women. Congolese refugees have fled to neighboring African countries, only to find conditions similar to that of their homeland. The U.S., once again, provides great relief for these people. 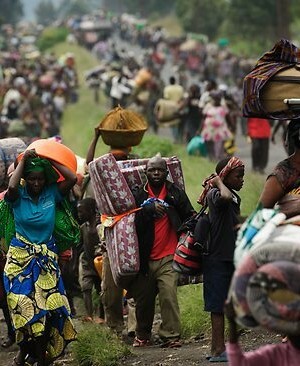 Refugees suffer from some of the world's worst humanitarian crises, living lives of instability and persecution. The U.S. acts as a much-needed sanctuary. If you are interested in learning more about refugees or wish to help check out the International Rescue Committee: a non-profit working to bring safety to those who need it most.